I love children’s books. I loved children’s books when I was a child. I loved children’s books when my children were young. And now that my children are older, I love giving children’s books to new parents. Since I haven’t been in the market for new children’s books for about a decade, I rely on the books I loved reading to my children, especially the ones that made us giggle. 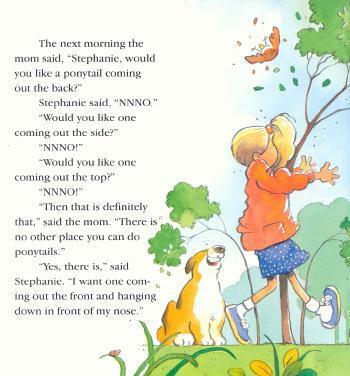 Stephanie’s Ponytail by Robert Munsch was one of those books. If you’ve never read it, the story centers around Stephanie, who likes to be unique. But every time she attempts to change her ponytail, her peers first make fun of her then copy her. By the end of the book, Stephanie remains true to herself and takes control of the situation. Posted on January 24, 2014, in Family, My life, perspective and tagged 365 reasons to smile, books, children's books, helping, musings, smiles, Stephanie's Ponytail, Thoughts. Bookmark the permalink. 20 Comments.